The Get Well Gabby Foundation recognizes the obligation to its supporters, customers, community and online visitors by being dedicated to the fundamentals of protecting consumer privacy on the Internet. The Get Well Gabby Foundation website uses security measures to protect against the loss, misuse, and alteration of the information under our control. We store the information in a database in a secure environment at our data center. We will never share, sell, or rent individual personal information to anyone without your advance permission or unless ordered by a court of law. Information submitted to us is only available to employees managing this information for purposes of contacting you or sending you e-mails based on your request for information. The Get Well Gabby Foundation collects personal information from our visitors only on a voluntary basis. We do not require this information for customers to obtain access to our site. However, in order to participate in some of the programs offered on The Get Well Gabby Foundation website, you may have to provide personal information. Occasionally, we may also ask for personal information for our own internal marketing use. You may provide this information on a voluntary basis. If you provide this information to The Get Well Gabby Foundation, we will maintain your privacy and will not sell or provide this information to third parties. Only those people who ask to be added to our promotional newsletter list or who ask for information from us will receive e-mail communications from The Get Well Gabby Foundation. We also offer an “Unsubscribe” feature that allows you, at any time, to have The Get Well Gabby Foundation discontinue e-mail communications. The Get Well Gabby Foundation uses standard website server log files. This includes internet protocol (IP) addresses, browser type, internet service provider (ISP), referring/exit pages, platform type, date/time stamp, and number of clicks to analyze trends, administer the site, track aggregate user’s movement, and gather broad demographic information for analytical use. The Get Well Gabby Foundation may use “cookie” technology to obtain non-personal information from its online visitors. Cookies are information files that your web browser places on your computer when you visit a website. Most browsers accept cookies automatically, but can be configured not to accept them or to indicate when a cookie is being sent. We do not extract personal information in this process nor do we provide this information to third parties. We also do not contact you. Cookies allow us to customize your user interface to speed up the navigation process and to make the site experience more efficient. If your browser is configured to reject cookies, you may not be able to utilize some features of The Get Well Gabby Foundation website. If you have any questions about The Get Well Gabby Foundation online privacy policies or procedures, please contact us. We work hard to ensure all the information on our website is accurate, but we are not responsible for anything resulting from typographical errors or errors in information that has been provided to us by third parties. Use of our site constitutes consent to this policy. 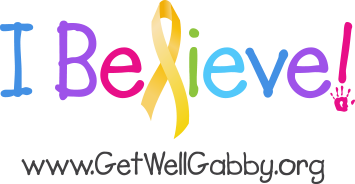 The Get Well Gabby Foundation will provide a reasonable amount of technical support to help resolve technical issues customers may have regarding purchased products. Since customers’ individual computers use a variety of platforms and software and may be subject to network security systems or policies, we may not be able to resolve every situation, but we will do our best to help as much as we can.